It’s another month and another History in the News Round-up. And yes, you read right–climate change is part of the picture, revealing artifacts frozen in glaciers and historical sites in drought-stricken lands. The stories in this installment all have a political aspect whether it’s a country petitioning another for a looted museum piece or a country’s proposals to destroy its own heritage over the objections of its citizens. We’ll start with Turkey’s troubles. Fresh water for agriculture, manufacturing, power and human consumption is becoming a scarce resource in many parts of the world. Dam projects in Egypt, China and many other countries have sent archaeologists scrambling to investigate, preserve and, sometimes, even move threatened historical sites. This month, it’s Turkey’s turn. At least two major archaeological sites are slated for destruction by dam projects and have been making news. Recently Turkey’s environment minister stated that one site didn’t even exist.“There is no such place as Allianoi. It is just a hot spring that was recently restored called ‘Paşa Ilıcası,’” said Minister Veysel Eroğlu in response to a question about the controversial plans to bury the ancient city with sand before a dam is built. 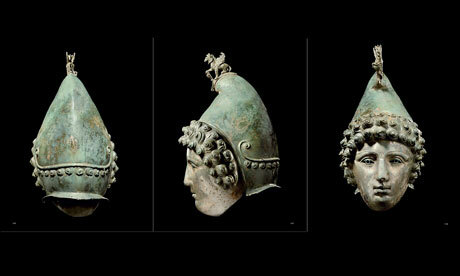 Update on this story: the helmet was sold to a private buyer for $3.6 million after a spirited 6-way bidding war. Tullie House is trying to get the new owner to allow it to be displayed at their museum for part of the year. I’ve been to some historical sites in Turkey, as a tourist only. They are breathtaking and interesting. It’s a sham the govt find it hard to keep them.